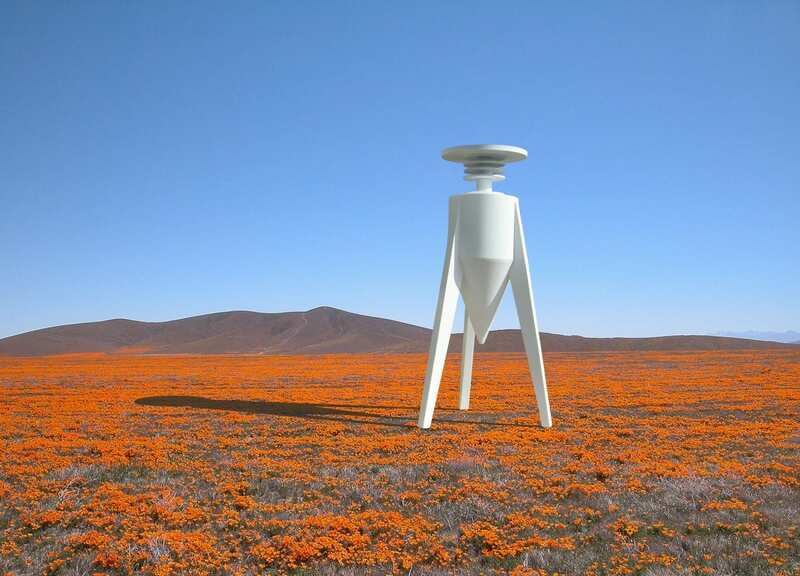 The imaginative renderings of Michael Jantzen present architectural forms that intervene on the natural environment and challenge our perception of design. Jantzen considers himself to be an artist, inventor and designer who often explores the art of architecture. The projects presented herein are not scheduled for construction but are concepts. His work is inspired by nature, technology, science, and electronic music. The materials and scale of his work change depending on the project, and on the site-specific requirements. Jantzen is not driven by a particular aesthetic instead I let the style evolve with the design. The Entangled Pavilion is informed by my interest in the theory of entanglement. In physics the manipulation of one particle can remotely affect another in the same way. The Pavilion would be a complex and extensive structure to build and would require the expertise of an engineer, as well as a kinetic engineer, steel fabricators and painters. In the center of the full size Entangled Pavilion, there is small model of the structure. The fabrication of the moving parts of the Pavilion would prove to be the most challenging component of construction. People visiting the Pavilion can move parts of the model and the full size pavilion moves in the same way. I see this as a new way to interact with the built environment but I intend to further explore the project’s many intriguing implications. The Stair-Scape Cubes were originally designed to be a functional art piece. The practical aspect of the Stair-Scape is to encourage people to climb on them for exercise. 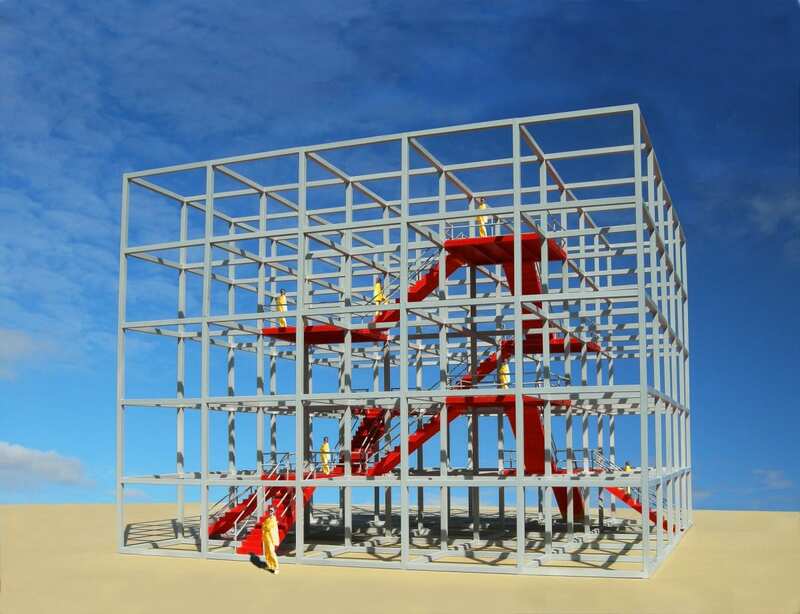 In the case of the large grid cubes, people climbing on the stairs would also receive an exciting spacial experience as they move through the complexity of the open grid frame. Interactivity is the key component here. 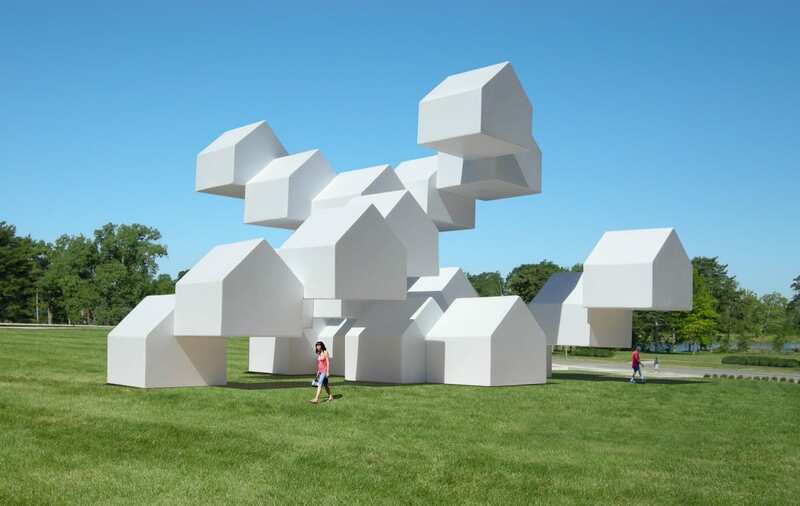 The House as a Metaphor is part of a series of public art proposals that would either be constructed of painted steel or wood if they were smaller. These are very conceptual pieces designed to explore the symbolism behind the image of the conventional house. 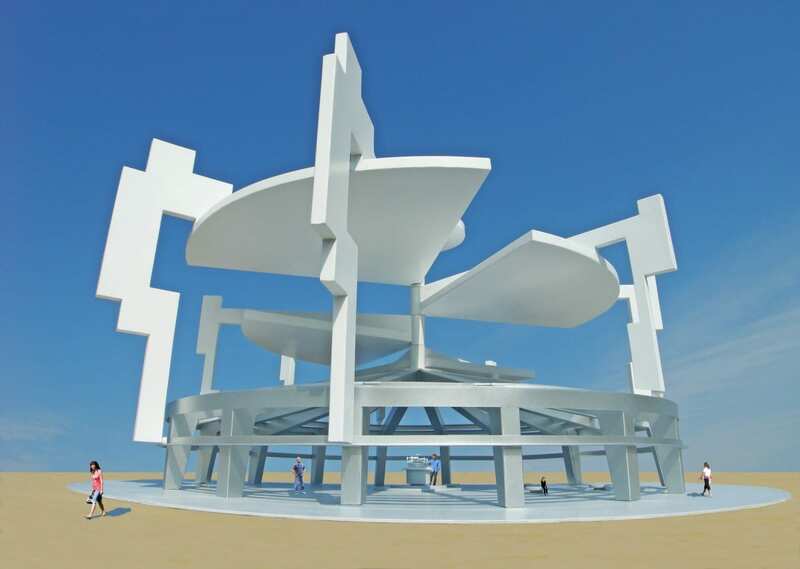 In most cases they are meant to be fun, and even funny structures in white that would be ideally located in public parks in order to reinforce the symbolic nature of the designs. The Eco-Seed Sowing Machines was inspired by my own concern for the planet’s continued degradation. The project was also designed to represent the interconnection between everything and everyone on the planet. In order for the Machines to operate properly Earthwatch Institute would have to provide appropriate information that notifies the machines to release the seeds at the right time. As the sun light moves over the surface of The Sounds of the Sun Pavilion during the day, it produces ever-changing electronic sounds patterns that are based on the ways in which the light interacts with the surface of the structure. This increases the complexity of the total experience when visitors encounter the Sounds of the Sun Pavilion. 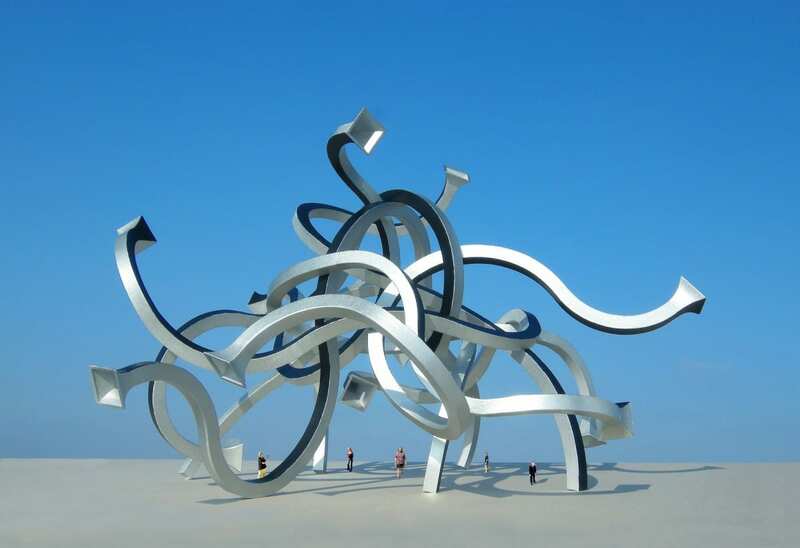 The aim of this piece was to create a very complex form that interacts in a very unexpected way with its environment. The structure of The Dark Shadows Pavilion would be made of bent steel pipe, and black painted wood. The bent steel pipe is used as the support structure, and the black painted wood is attached to the pipe frame with special brackets that would allow the wood to be rotated around the pipe in different directions. This project is one of a series of small-scale pavilions that blur the lines between art and architecture and explore the aesthetics of shadows. I wanted to give the illusion of a shadow even if the sun was not shining. When the sun is shining, the structure and the shadows of the structure merge so that the Pavilion appears to increase in size. Stay tuned as Michael Jantzen, Yellow Slanted Pavilion will be installed in the Bruno David Gallery in St. Louis this summer! 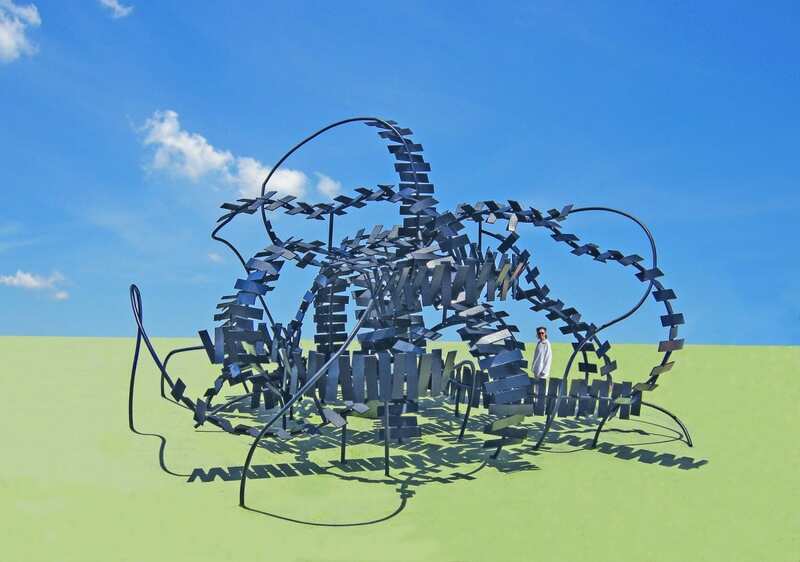  Archived in Uncategorized and tagged Architecture, artist, Cube, Dark, Designer, Emerge, Entangled, inventor, Issue 30, Michael Jantzen, Modular House, Pavillion, Prototype, Shadows, Sounds, Stair, Sun. Bookmark the permalink.